110 Girls Missing In Latest Suspected Boko Haram Attack, Says Nigerian Government : The Two-Way Officials have changed their accounts of the alleged kidnapping, after initially claiming the girls were rescued. Four years after Chibok, there are now fears another mass abduction has happened. Soldiers drive past a sign leading to the Government Girls Science and Technical College staff quarters in Dapchi, Nigeria, on Thursday. Scores of schoolgirls have been reported missing in Monday's suspected Boko Haram attack. When Boko Haram extremists snatched 276 girls from a boarding school in northeast Nigeria in 2014, the world reacted and rallied around the cry of "bring back our girls." But now, some four years later, it appears to be happening again. The Nigerian information ministry told Reuters Sunday that 110 girls remain unaccounted for nearly a week after a suspected Boko Haram attack on another girls' school. 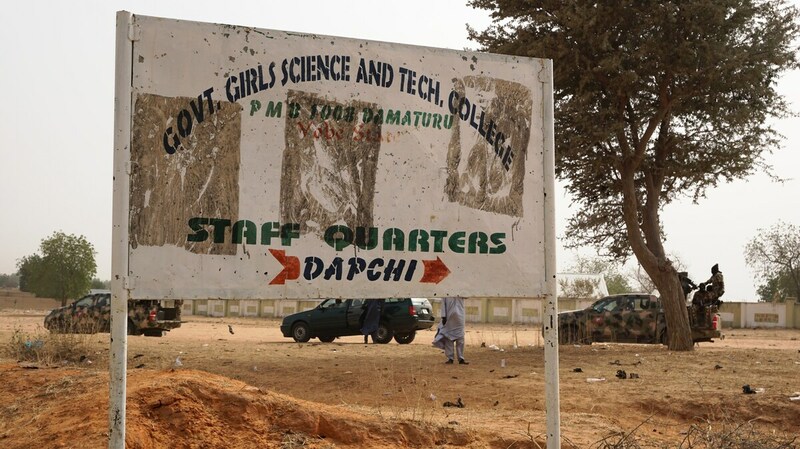 Early reports indicated that dozens of schoolgirls had been rescued following the attack on the Government Girls Science and Technical College, located in the town of Dapchi in Yobe state, less than 200 miles north of Chibok. Hassana Mohammed, 13, who scaled a fence to escape Monday's alleged Boko Haram attack, stands outside her home in Dapchi, Nigeria, on Thursday. "Parents of dozens of girls missing from Dapchi government girls' school in Yobe state were waiting to be reunited with their daughters. However, the state governor told them no girls were rescued by the Nigerian army, despite earlier erroneous reports sparking street celebrations, only for forlorn families to have their hopes dashed." "We have now established that the information we relied on to make the statement was not credible," said Abdullahi Bego, Yobe State spokesman, on Thursday, according to media reports. "The Yobe State government apologizes for that." Not only was the number of missing school girls difficult to pin down, so too were details of the attack. Authorities had said early on that the militants were looting food rather than attempting abductions. They said the school's almost 900 students plus their teachers had managed to run away and hide in the bush, Ofeibea said. 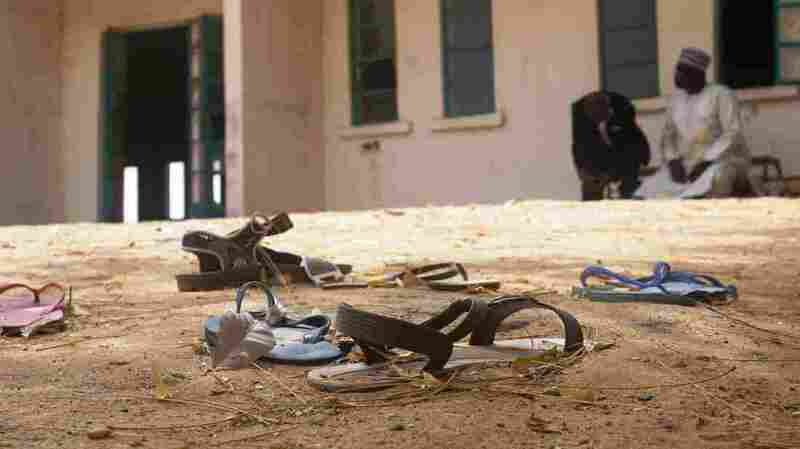 Sandals abandoned in the yard of the Government Girls Science and Technical College staff quarters in Dapchi. Now the story has taken a brutal — if familiar — turn. "This is a national disaster," tweeted President Muhammadu Buhari on Friday. "We are sorry that it happened; we share your pain. Let me assure that our gallant armed forces will locate and safely return all the missing girls." Buhari said the government is sending "more troops and surveillance aircraft to keep an eye on all movements in the entire territory on a 24-hour basis." In another tweet, he said, "no effort will be spared to ensure that all of them are returned safely, and the attackers arrested and made to face justice." I want the families of the girls yet unaccounted for at the Government Girls Technical College, Dapchi to know that no effort will be spared to ensure that all of them are returned safely, and the attackers arrested and made to face justice. Even though the government has claimed in the past that Boko Haram had been defeated, the militant jihadist group continues to vex especially in the country's restive northeast region. 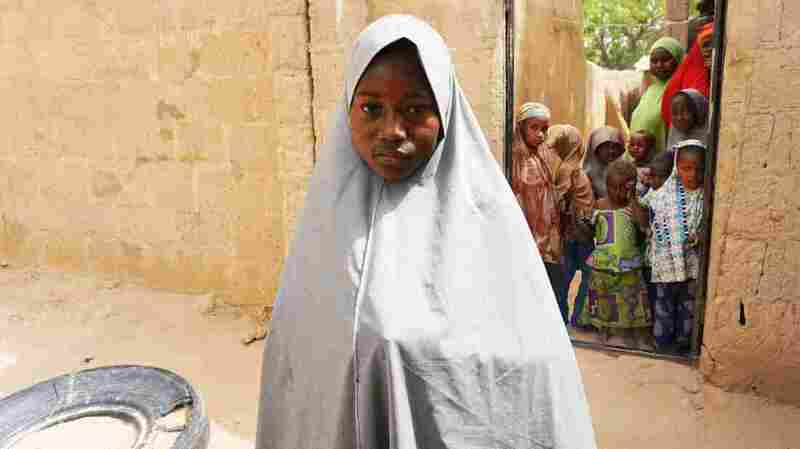 Ofeibea has reported "Thousands of girls, boys, women and men have been abducted by Boko Haram," since 2009 when the group began waging an insurgency to form a breakaway state. The group has killed some 20,000 people and driven 2 million from their homes, reports Reuters. "And Boko Haram's name is 'Western education is sinful,'" Ofeibea reports. "So you cannot get away from Boko Haram." As for the Chibok girls, while many have returned home, many others remain in captivity. Those who got away tell of surviving in the Sambisa Forest, enduring beatings and torture as well as pressure to marry their captors and convert to Islam, reports Reuters. The parents of the Dapchi girls tell the wire service they plan to join the Bring Back Our Girls movement in the hope that they too can capture global attention and spur governments to act.